Celebrating Family Social Events and events. In Aranjuez, in a rural setting, surrounded by fruit trees and cornfields, we renovated an old farmhouse for your break. It consists of: First floor: kitchen and dining room, four double bedrooms and bathroom. Ground floor: kitchen and dining room with fireplace and sofa bed, two double bedrooms and two bathrooms. Great Hall. 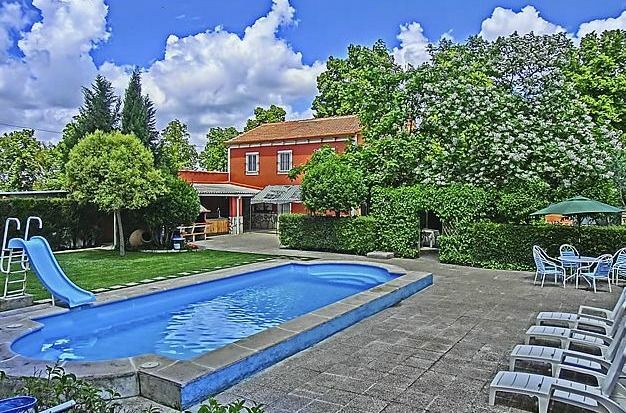 All this surrounded by a magnificent garden with fruit trees and corn plantings, swimming pool, sauna, sunbeds, garden, barbecue, gazebo, bar and private parking.